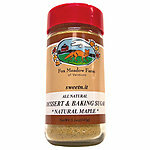 The subtle sweetness of maple sugar and the spiciness of black pepper combine to make an extraordinary seasoning for meat, seafood, vegetables (even brussel sprouts! ), eggs, salads and dressings. INGREDIENTS: Natural Cane Sugar, Sea Salt, Black Pepper, Maple Sugar, Rice Flour (anti-caking), Natural Flavor, Lemon Crystals. 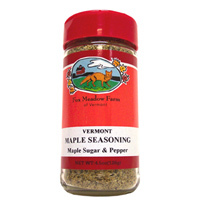 Toss Vermont Maple & Pepper Seasoning and 2 Tbs. oil with onions, cubed squash, parsnips or other root vegetables. Place on a sheet pan. Cover and roast in the oven at 375 degrees for 40 minutes. Uncover and roast an additional 30 minutes.